The number one killer lurking in the modern world is none other than cardiovascular disease. The main causes for cardiovascular diseases are a sedentary lifestyle, and the consumption of unhealthy, fast food. Cardiovascular diseases are called silent killers as there are no signs or symptoms that indicate a cardiovascular problem. The only thing that can be done to avoid a cardiovascular disease is through good cardiovascular fitness. The cardiovascular system of the body consists of the heart and its blood vessels. With optimal cardiovascular fitness, the heart and its blood vessels are in the best condition possible to pump blood well throughout the body; this is because the circulation of the heart is improved as a result of exercise. The heart that is well conditioned through exercise can pump more blood with fewer beats than a weak heart can. Cardiovascular fitness is possible only through exercise, where the heart grows more resistant to stress, heart attacks and other health problems. It is only with regular exercise that cardiovascular functions are improved. There are some people who find just the climbing of stairs a Herculean task. This is because they are out of shape. It is only with regular exercise where cardiovascular fitness is established that it is possible to maintain your shape. Without any exercise, the body undergoes changes that tend to threaten the heart. If overeating is combined with a sedentary lifestyle, body weight and cholesterol levels tend to rise. This in turn leads to heart disease and circulation problems. However, this is a reversible process where the making of the heart fit through exercise and good eating habits, helps in the decrease of blood pressure and HDL cholesterol levels, while at the same time, the good cholesterol levels in the blood tend to rise. The benefits of all of this is fat loss, which in turn is also good for the heart. For optimum cardiovascular fitness, it is advised to do at least 30 to 60 minutes of aerobic exercise about 3 to 4 times a week. 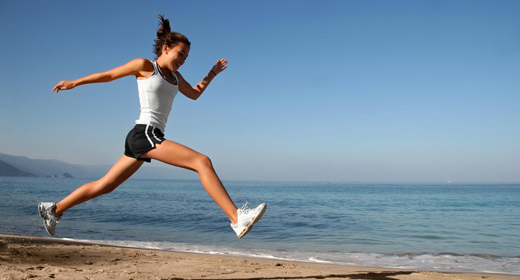 Walking, aerobic dancing, bicycling, jogging, hiking, and swimming are all forms of aerobic exercise. Doing them four or more times a week will increase your health benefits. This is because large muscle groups are used for a long time with aerobic exercise. To handle this workload, the muscles need more oxygen; and this is possible only with the heart beating faster. You may start having heavy and fast breathing while meeting the need for oxygen; however if you wish to have some benefit of the exercise on the heart and lungs, it is necessary that you exercise in the aerobic heart beat range. You know you are in the aerobic range when you can speak and breathe without any gasping. So if you find you can’t speak to a companion while exercising, it is better to slow down the pace of the exercise. With regular exercise, your cardiovascular fitness is improved and the risk of coronary artery disease and blocked arteries are reduced. It has also been seen that anxiety and depression tends to decrease with regular exercise and improved cardiovascular fitness so that you can live a happier, and more tension free life. Remember that without any physical activity, or cardiovascular fitness, you will not only suffer from obesity, but you may suffer from various health conditions. You may suffer from a possibility of strokes, osteoporosis, colon and breast cancer, type 2 diabetes and even death due to coronary artery disease. So it can be seen that cardiovascular fitness is very important to lead a healthy and happy life.